Sometimes it's difficult to decide what leather photo album is the right choice for you. First it's important to consider what its purpose will be. Will you be using it as a family keepsake for all sizes of photos, or will it be professional accessory used to demonstrate your products and services. Will it be personalized? These are important questions to consider when you're making a decision. You will need to ask yourself what size images the photo album or portfolio will need to accommodate. The 8.5 x 11 leather photo albums are great for digital images and documents, they will slide right in with minimal mounting effort. Any 8 X 10 images will fit nicely in these albums as well. This album is also more portable. If you plan on taking it on sales calls it is a much more convenient portfolio for that application. The 12 x 12 photo album is also a great choice. It gives you the freedom to mount whatever you like upon its top loading pages, and it has a much more dominating presence. The 4 X 6 leather photo albums are great for the simple convenience that they offer. You just slip in your 4 x 6 photos and you're ready to go. The second question that you need to consider is what type of abuse is this album going to be exposed to? Glazed calf is very shiny and smooth. It makes a great choice for a coffee table album, but it's really not something that you want to be carrying around with you every day. It will scratch much more easily than other leathers that are available. 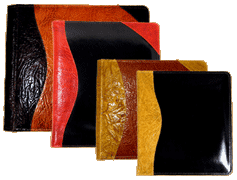 For working albums the best choice by far are the shrunken shoulder leather photo albums. This material is absolutely beautiful, and full of character. It is almost impossible to damage the finish. This material is recommended for presentation portfolios, modeling portfolios, sales portfolios, and albums that will be vulnerable to wear and abuse. It's also a safe bet for the coffee table too, it's absolutely gorgeous. The next consideration will be whether or not you'd like to personalize the album. We will be happy to help you decide. If you have any questions concerning what might be best for you please feel free to call us here at Powell Leather, and we'll be glad to help you in any way that we are able.